There is nothing more satisfying than knowing that everything is taken care of. It reminds me of the way that the Lord prepared the disciples for His departure and what was going to come. He was letting them know that no matter what they needed, He was going to make certain that they were able to receive it.How does all of this happen? Obedience...full obedience. Sometimes people think that its what that do, the good things, the time spent, the money invested into what God is doing that brings the blessings. Fact is it is simple, pure obedience. When we fully obey we start going His way! Deuteronomy 28 talks about this "full" obedience. When we fully obey we are blessed in every way! Blessed in the city and the country. Blessed coming and going. Our kids, our crops, our friends...everything that is connected to us can receive His blessing because we choose to obey Him. So as you prepare for this easter weekend, take a look at how well you are doing what the Lord is asking of you. Has He asked you to serve and you've been hesitant? Has He been prompting you to share with a neighbor and you've pushed it aside? 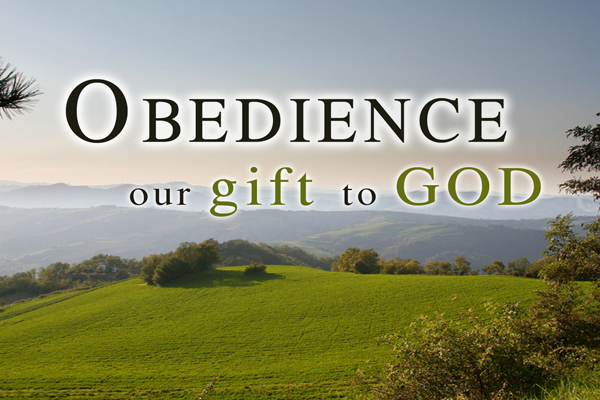 Our gift to God brings His gift to us...obedience. Stop waiting...today is the day that the blessings of God are released upon you. Today you obey! Now go do it!